With G-Force entering the market this week, an underdog to supplant the mighty Harry Potter, we at The Exchange immediately thought, “There’s no science here.” Then, we realized that in the scientific community guinea pigs have a special history, a centuries-old relationship. It’s a little known tale of love, loss, and even triumph. So here it is: the true guinea pig, selfless helper of humanity. Neither a pig nor from Guinea, these strange rodents evolved to maximum cuteness in the Andes. They immediately became popular as household pets upon their introduction to Europeans in the 16th century due to their relative low maintenance, good looks, and easy temperament – in other words: their high threshold for being abused by children without seeking revenge. 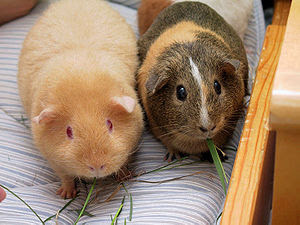 The use of guinea pigs as, well, guinea pigs in laboratories began in the the 17th century, when they played a significant role in several major discoveries. Louis Pasteur made use of them in establishing germ theory on his way to co-founding the field of microbiology. Guinea pigs also helped fuel research that lead to a better understanding of anatomy and the way mammals burn calories. Years later, they were made into some of the world’s first astronauts when the USSR launched them into orbit in the early 1960s. While their popularity today in scientific research has waned in favor of rats and mice, guinea pigs are still used in the development of anti-virals, vaccines, and also as simulators of the human body’s reaction to several major diseases. So, maybe guinea pigs don’t need to wield a machine gun, drive a motorized ball like a race car, or have latest spy gadgetry to be considered heroes. The next time you find yourself face to face with one of these little guys, consider shaking a paw and saying a simple, “thanks” – though we hear they may appreciate an alfalfa pellet more than your sincere gratitude.